Do you stare up at the stars like an angsty young (rebooted) Captain Kirk? Sure, becoming a NASA astronaut in the military is a rare opportunity, and maybe your long-term goals don’t otherwise include the officer’s commission, pilot’s wings, or doctoral thesis commonly found on an astronaut’s resume. That doesn’t mean that your goals have to stop at the lower atmosphere. On the enlisted side, the Air Force maintains a cadre of Space Systems Operators that support both military and national goals beyond the clouds. 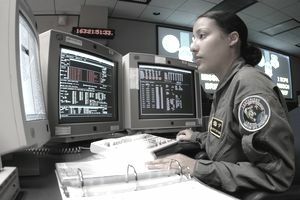 Space Systems Operators are split up until several functional areas depending on their duty assignment, but all support Air Force space-related missions via console, similar to the work of an air traffic controller. Space Systems Operators need to meet medical qualifications for space operations, which include normal color vision, hearing, and equilibrium; absence of chronic migraines, epilepsy, or psychological conditions such as claustrophobia; and preclude those with regularly prescribed medications that “affect alertness, judgment, cognition, special sensory function, mood or coordination,” according to the Air Force Instruction on Medical Examinations and Standards. Candidates must also pass a background check with eligibility for at least a Secret-level security clearance. Although not required, high school work in physics, geometry, trigonometry, algebra, and computer science are all considered helpful primers by the authors of the Enlisted Classification Manual. Preparation for a career in Space Systems Operations begins at Vandenberg Air Force Base, California, following basic training. All airmen start with Space 100, a month-long primer on the whole space operations career field, covering “launch, missile, warning, and safety.” The course, described by some as more challenging due to its breakneck pace than its content, leaves students ready for follow-on training specific to their first duty assignment. These follow-on courses vary in length and prepare airmen for assignments such as space lift operations, missile detection, and satellites. Although the Community College of the Air Force (CCAF) Credentialing and Education Research Tool comes up pretty scarce on suggestions (just two professional management certifications), it does advertise CCAF’s optional degree program for Air and Space Operations Technology. Beyond the Air Force, successful duty in Space Systems Operations has the apparent advantage of your security clearance. Civilian careers that require experience with security, radar, and mission management are prime targets. Unfortunately, America’s switch to a privatized model for manned spaceflight has pained a lot of NASA employees on the “space coast,” according to Payscale.com. This seems like a bad omen, but some of the trouble may stem from: (a) workers who won’t relocate or are facing a late-life career change and (b) the fact that this is (hopefully) just the rocky start of a new stage in the industry. For those with galactic-sized ambitions, the privatization model will hopefully develop new and more jobs in the civilian sector as this industry gets off its feet--a prime place to go after starting off as a Space Systems Operator in the Air Force.